How to draw Anime Asuka from Evangelion series. 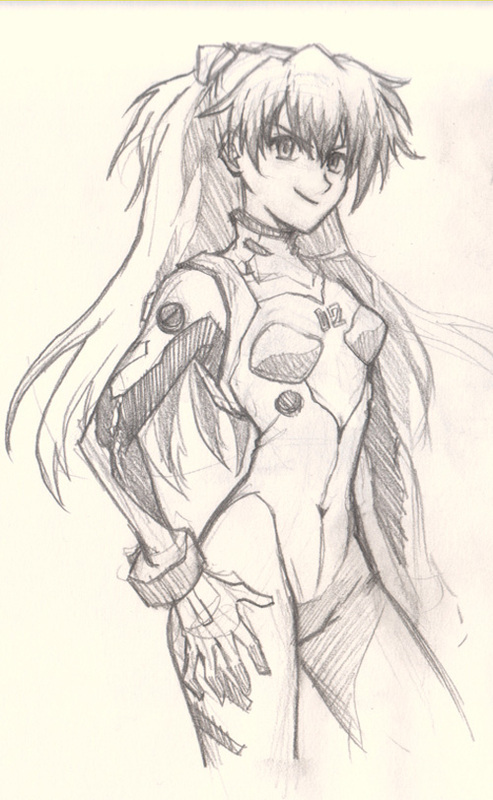 In this tutorial, you will learn how to draw an Anime girl from Evangelion, Asuka. This should be easy to medium level artists to follow. If it is a bit too fast for you, press pause. Then you can keep drawing along. You will find video tutorial on the top. You can scroll down further to see step by step images with instruction. 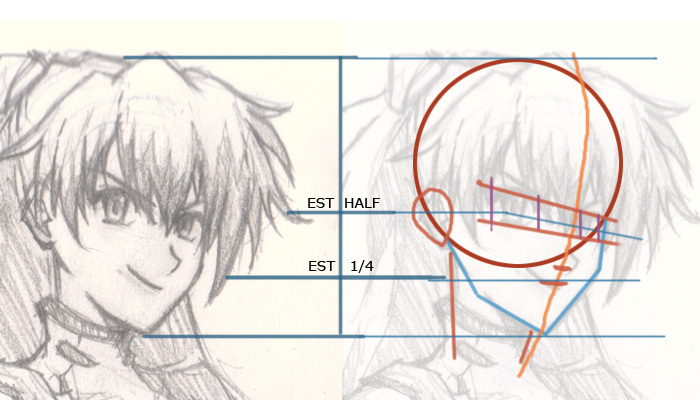 This is a tutorial of how to draw Anime face and body base on the character from Evangelion, Asuka. Basically when drawing a figure, don’t think too complicate, try to keep it simple. I usually look at the figure and try to break it down into basic shapes like rectangle, oval, circle, etc. Do not let the organic form intimidate or fool you. You have to look at the body of human form and break it down into the most simple shape that are easy for you to start off with first. The best advice I can give for drawing figures (no matter realistic, comics, Manga, Anime or cartoon), it is best that you go drawing people from real life for example in life drawing session. If you are serious about drawing, you have to go weekly. Serious drawing can make serious money, you also get to draw all day. I’ve seen so many horrible tutorials online, but I won’t even talk about it. They make me sad. A bit about her history, Asuka Langley Soryu (惣流・アスカ・ラングレー Sōryū Asuka Rangurē?) is the Second Child and the pilot of Unit 02. Yuko Miyamura voices her in the Japanese series, and Tiffany Grant in the English adaptation. She is of mixed German and Japanese descent, but her nationality is German. Asuka is brash, egotistical, and often verbally abusive (especially to Shinji), and has a very high opinion of her appearance and her considerable skill as an Eva pilot. 1) I started of with an oval shape facing three quarter view. Then I drew a spine down to indicate where her body will be positioned. For female, it is important to keep the line fluidity in “S” or “C” shape. It will accentuate the feminineness. 2) I add a rectangle shape as a simple torso design. Oval as her hip below the rectangle shape. Oh, and a cylinder for the neck. 3) Base off the previous geometry shapes, I drew over with smooth organic line that connect all the body part together. **See more detail on the video tutorial. 4) After I had her body rough out, I then go over her face and sketch some initial part to dictate where her eyes, nose and mouth would located. It is still very rough at this point, but readable. 5) I then drew several big shape for her hair pieces. You have to try to look at her hair and break it down into groups. Once you identify hair groups or clumps, then you have to roughly draw shape that would look similar to the hair clumps. Do not try to get tiny little detail in right away, look at the big picture first. Break down the big shapes. 6) Once I have all the big shapes broken down for hair, I then drew additional detail like spikes and such. Then I drew over the rough facial sketch and trying to bring out the solid and darker line for face. 7) As I explained earlier for hair, now I am trying to finish the whole head of her hair since I already had it broken down. 8) Now I drew over the previous body sketch and try to maintain the shape and correct the proportion at the same time. At this point, I am not trying to finish it yet. I am just trying to draw her whole body to make sure the proportion looks good. 9) then I will eventually finalize with darker drawing over it again. Voila! Now you have your Anime girl Asuka drawing. Congratz!